Overview of Southeast Alaska Southeast Alaska is a narrow strip of coastline and offshore islands next to the province of British Columbia, sometimes referred to as the Alaska Panhandle. To local residents it is known simply as "Southeast." The region south of Glacier Bay consists of thousands of islands of various sizes which are collectively known as the Alexander Archipelago. These islands protect the more inland coastal waters, called the Inside Passage, from large waves, making them relatively easy to navigate. Most areas of Southeast Alaska below 500 meters elevation are heavily forested with conifers. With 100-300 inches of rain per year, the region is a temperate rainforest. Water is everywhere in the form of streams, lakes, bogs, and soggy vegetation. The forest undergrowth is lush with ferns and mosses. The scenery of this coastal paradise is truly spectacular, but local residents complain that living for months without seeing the sun can lead to depression! 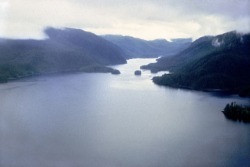 Most of the land area of Southeast Alaska is encompassed by TongassNational Forest, MistyFiordsNational Monument, and Glacier BayNational Park. Because of the large amount of rain, one of the main controls on the vegetation is drainage. On steep slopes and in karst areas where water can escape, the trees grow very large. In flat areas of poor drainage, mossy bogs and ponds called muskegs form, and trees are stunted or nonexistent (see photo below at right of muskeg boardwalk near Sitka ferry terminal on Baranof Island). These bogs can be extremely acidic--as low as pH 2.4! The steep, rocky terrain and the many islands and fjords make Southeast Alaska very difficult to navigate. Because of the sparse population, there are only local road systems except for the northern mainland town of Haines and Skagway, which are connected to the Alaska Highway. Therefore travel between the islands and between mainland cities is limited to boat and aircraft.